Melatonin may be effective in treating several primary headache disorders, particularly cluster headache and migraine. Future research should focus on elucidating the underlying mechanisms of benefit of melatonin in different headache disorders, as well as clarifying optimal dosing and formulation. The main purpose of this study is to assess the long-term safety and tolerability of galcanezumab administered up to once monthly in participants with episodic or chronic cluster headache who have completed study I5Q-MC-CGAL (NCT02397473) or study I5Q-MC-CGAM (NCT02438826). 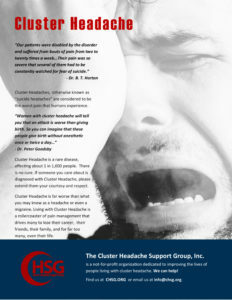 Chronic cluster headache is rare and some of these patients become drug-resistant. Occipital nerve stimulation has been successfully employed in open studies to treat chronic drug-resistant cluster headache. Data from large group of occipital nerve stimulation-treated chronic cluster headache patients with long duration follow-up are advantageous.